Inwelle Centre is based on the foundation that the road does not end when the traveler has tar, coal, and the determination to take the next step. Our key objectives are to (1) provide educational resources to the community, and (2) change the reading habits of the community. The Centre is currently structured in a manner that is conducive to private and group meetings, formal job training classes, and computer laboratory and library. The Centre also provides other training such as teaching patrons how to use word processing programs and perform paper and electronic research. Our services provide a source for completing class projects, researching personal interest, or staying in touch with technology. The Centre also changes the way the community obtains educational resources. A widespread problem in this community is the lack of current resources for students and lecturers. This problem is addressed in several ways involving electronic and paper options. 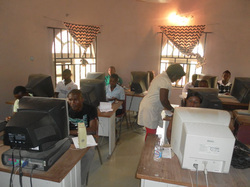 The Centre provides internet access to community patrons. This gives the patrons an opportunity to conduct research online, thus accessing up to date information from different parts of the world. The Centre also updates its holdings as frequently as possible, thus providing up-to-date material to patrons who prefer paper research. The Centre also employs staff members who keep abreast of publications in different fields. The staff members keep an open communication with educational communities in different countries, and note the resources from which those other communities obtain their information. The Centre cultivates the community’s reading habits. We have programs such as Youths Helping Youths (YHY) where we encourage young adults to rise above their regular classwork and seek intellectual superiority. The club is run by senior secondary school students between the age of fifteen and eighteen. The senior students create reading lists and book clubs for the junior secondary and elementary school students. The reading lists give students a starting point for their new interest in reading. The reading lists are divided into different groups such as grade level reading, suggested improvement reading, educational reading, etc. The book clubs give the students a forum for discussing their reaction to the readings. The book clubs are divided into grade levels, tutorial sessions, etc. Our project can be summarized in three words: fulfilling a promise. Conducive reading and meeting rooms, computers and internet access to indigent patrons. The platform for scholars to visit the Centre and share their knowledge with the students, teachers and other members of the community. Youth energy is negated during the elections. The youths are recruited as thugs to undermine the elections because they are indigent, and idle. We need to harness these youths’ energy positively through re-orientation that broadens their scope of understanding and aspiration, enables them to shun recruitment as thugs, and improves their ability to interrogate and assess the democratic process in their localities. Being unemployable, many youths become a recruiting ground for politicians seeking for thugs. The project focuses on skills acquisition, counseling, and access to information to enable them shun jobs as thugs and increase their self esteem and sense of worth. We seek to foster evolvement of a strong, vibrant and democratic youths that can enhance the activities of civic society, aid development of skills and standard that enhance democratic decision making within the Youths Helping Youths club, and participation in political democratic process, aid enhanced access to knowledge capital through access to technology and computer literacy and build capacity to act as checks and balance groups at the grass-roots level.